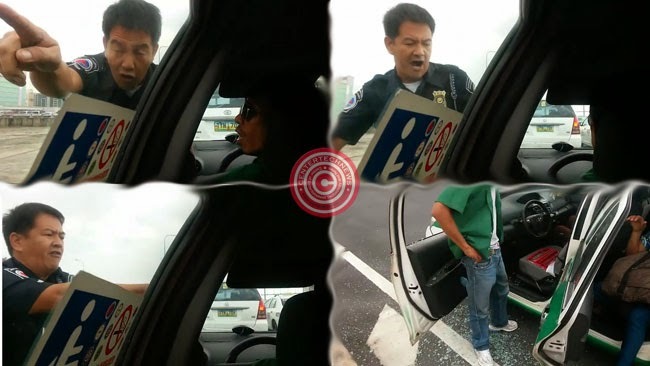 A video of a NAIA Police officer breaking a taxi’s window while arguing with the taxi driver is now making its rounds over Facebook. Various opinions are now flooding about the uploaded video and in just four hours it had been viewed more than 238,303 times. The video posted by a Facebook account under the account name Grace Fabie had shown a NAIA Police officer asking the taxi driver for his driver’s license. The video was recorded by the passenger and the tension was evident right from the start. According to the officer, the driver had picked up a passenger in a no loading and unloading area. It seemed that the taxi driver was aware of the violation but refused to show his license as he protested saying that many others had done the same thing. The NAIA Police stated that the driver’s statement does not have any connection with his violation. The argument heated up leading the policeman to slam car’s hood and eventually breaking the window at the driver’s side. The officer then promised to pay for it but still insisted for his license. The passengers were shocked with what the officer had done. And asked not to include them in the argument. The driver soon yielded and gave his license. Many Facebook users shared their views and said that the policeman was rude and did not have to resort in such violence. It is evident that the taxi driver did a violation but no matter how heated, the policemen had no right to break someone else’s property. Some also opined that the driver was really at fault as he knew he did a violation and still refused to give his license. Share your thought on the comment section below.